Although traveling around via RV is always fun, one drawback is that maneuvering can be tricky since these vehicles are so large and cumbersome. In some cases, backing up a massive Class A rig can seem all but impossible, particularly if you’re in a relatively tight area. In those instances, you will need one of the best RV backup cameras. Today we’re going to take a look at some of the top models available, as well as discuss why they can be so helpful while on the road. Even if your RV has a camera installed currently, these units have features and benefits that can add value to your driving experience. When picking out an ideal backup camera for your RV, you will want to pay attention to the quality of the camera itself, as well as any monitoring system that it comes with as well. In this case, we have a high-quality one-two punch, with both a dazzlingly clear camera, as well as a remarkably HD viewing screen. Regardless of the size of your rig, this camera system is ready to go and is a breeze to install. Let’s see how it can help you with your RV. When backing up, you need to be able to see everything behind you as clearly as possible. If the image is fuzzy or distorted, then the whole thing won’t do you much good, and it can render the entire purchase moot. What’s nice about having such a large screen is that it’s much easier to spot obstacles, mainly because the image itself is in high-definition. You’ll be impressed by how well the camera feed looks, as well as how easily it is to maneuver when looking at this screen. Another integral part of any backup camera system is the fact that it needs a wide-angle lens. Otherwise, trying to get a sense of how much room you have both in the back and on the corners would be next to impossible. With 130 degrees, this camera shows you almost everything that’s going on behind your RV, even when you’re driving a massive rig. No matter how tight the space may be, you’ll have a much easier time navigating it with this wide-angle lens. Seeing your surroundings clearly during the day is one thing, but since your travels will most likely happen at all hours, you need to be able to back up efficiently at night as well. Otherwise, what’s the point of having a camera at all? Fortunately, this system is equipped with 18 different infrared lights, which give you visibility up to 50 feet in the dark. Considering that during the winter the sun goes down by 5 pm most nights, you’ll need to use each light to stay safe while you’re on the road. This backup camera and monitor system is comprised of high-quality components, and it’s super easy to install. It comes with everything you need, including a universal mount for the monitor. I also appreciate the clarity offered by the camera, especially when it comes to nighttime viewing. Having such a full field of vision ensures that you can back up safely and without worry that you’ll do damage to either your rig or your surroundings. Although there isn’t much wrong with this system, one issue I had is the menu controls. They are not as intuitive as I’d like, so it can feel a bit wonky when using the camera for the first time. Also, considering that you can hook up to three cameras to this system, switching between them can be a little tricky. Another potential issue is that the cord reaching from the array (where the camera plugs in) to the monitor is only six feet. In some rigs, that’s not enough length, which can pose a significant problem. In some instances, you already have a built-in monitor, but you need a new camera so that you can see easier (or perhaps your old one broke). In those cases, you’ll want something like this mini backup camera from TopTierPro. Although this camera is much smaller than most of the other ones we’ve already seen, that doesn’t mean that it’s any less useful or durable. This camera will hold up to a lot of environmental factors, including water, heat, and extreme cold. Simply put, you can feel confident installing this camera anywhere on your RV since it will withstand the elements with aplomb. Because this camera is so small, you can mount it almost anywhere. If you have a monitoring system that can take multiple cameras, then you might want to attach one to your mirror as well as the back of your RV so that you can get a comprehensive view of your surroundings. Compared to most other models we’ve seen, this camera has one of the widest angle lenses you can buy. Although this means that it can be a little trickier to discern what’s around you, having such a wide field of view is handy, particularly if you have a massive rig. If you just need a camera, then this is a great option. I like that it’s so small that you can mount it almost anywhere, as well as the fact that you get two (just in case you want a side-view mirror model as well). I also appreciate the rugged housing and the relatively easy installation that comes with this camera. This model can come with guide lines and be mounted for mirror imaging. However, to do those things, you have to go in and cut a couple of different wires. This seems unnecessarily complicated and potentially hazardous to the device itself. Also, if you don’t have a monitor already, then buying this camera is a moot point since it has to connect to one to work properly. For the most part, when comparing different backup camera systems for your motorhome, you will see that many of them come with the same components. That can make your final decision a bit trickier, but when you pay close attention to the details, it’s a little easier to spot the differences. Let’s see how this camera and monitor compares to the one above. In most instances, your backup camera is going to come with a decent-sized display monitor that will help you maneuver much more efficiently. Seven inches is always an excellent choice, provided that you have the room in your cab for such a system. The other great thing about having a larger display is that you can pick out details more easily that would get lost in a smaller image. Rather than having to squint to see what’s behind you, you only need a glance to get a quality view of your surroundings. When you’re backing up, then having a large monitor is helpful. However, considering that backing up is only a fraction of the movement you do in your RV, you don’t want to have a cumbersome display screen taking up valuable real estate in your cab. For that reason, this monitor comes with an adjustable mount so that you can lay it flat when it’s not in use. Also, if you mount it to the top of your cab, it’s much easier to correct the angle so that you can see it better when reversing. Considering that your backup camera has to stay on the outside of your rig at all times, it will get exposed to all of the elements. Fortunately, this model (as with most of them) is designed to take a beating. Whether you’re in sweltering heat or frigid cold, this camera has a weatherproof housing that ensures your investment is well protected. Overall, this camera system is easy to use and install. I like that the monitor is big and that you get an extra-wide field of view. Compared to the unit above, this one gives you 149 degrees of vision, which is most impressive. Unfortunately, the screen may be big, but the quality is not high-definition. The color grading is lacking, which can make it seem like this camera is actually in black and white. Also, the connectors can get jostled around, making the image a bit fuzzy at times. Although having a backup camera can be an integral safety feature for your RV, sometimes you don’t want to have to break the bank just to get something high-quality. Fortunately, this model from LeeKooLuu is designed to be as easy and painless as possible. Also, compared to some of the other systems we’ve seen so far, it’s much more cost-effective as well. Part of what makes this camera and monitor so enticing is that you can install it so much easier than other systems. All you have to do is mount the camera to your license plate frame and then plug the monitor into your 12-volt adapter. The camera gets its power from the reverse lights, so you don’t have to worry about running a cord all the way through your RV. Installation is a snap, meaning that you don’t have to be an engineering expert to do it. One element of modern backup cameras that I like a lot is the inclusion of backup grid lines. These help you understand how close various hazards are since it can sometimes be tricky with a wide-angle lens. 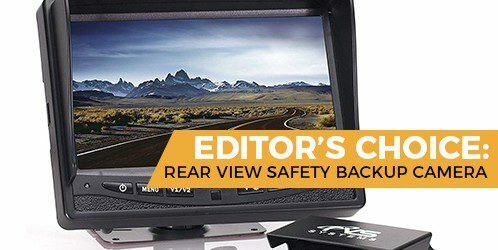 Although seven inches is mostly standard for backup cameras these days, having a larger monitor can take up valuable real estate in your cab. Thus, having a smaller screen can be a better option for some rigs, particularly for camper vans and shorter motorhomes. If simplicity is what you crave, then you’ll love this backup camera. I like that you can install it much faster than most of the other systems out there. Also, if you have limited room in your cab, you’ll appreciate the compact size of the screen. Night vision with this camera leaves a lot to be desired. While it’s not impossible to see in the dark, this model only has seven LED (not infrared) lights, so it’s trickier to do well. So far, we’ve been looking at wired backup cameras. However, if you’re looking for something easier to install into your RV, then a wireless unit may be the answer. Let’s see how this model stacks up to the rest. At first glance, it may seem that getting a backup camera with a wireless monitor is the best idea ever. This way, you don’t have to worry about running a cord through your RV, and you can change the placement of the camera itself later on without causing any problems. However, keep in mind that a wireless signal can be interrupted. In some cases, environmental issues like rain can affect its reliability, as well as other signals in the background (i.e., TVs or radio). Overall, wireless connections can be an excellent option, but keep in mind that there are some drawbacks as well. Looking at your surroundings has never been easier, thanks to the high-definition monitor that comes with this unit. This screen also has a glare screen on top so that sunlight beaming in through the windshield won’t affect your ability to see what’s on it. As with the other backup cameras on this list, you can rely on this system to stay in great shape all the time, thanks to the rugged housing, which is both weather and waterproof. Also, considering that this system relies on an antenna to work, the fact that it can withstand the elements is an integral feature. Installing this camera and monitor is a breeze compared to the other models on this list. Also, the definition and quality of the screen are excellent. The range for this unit may not be long enough for some rigs. Also, because wireless signals can be interrupted, you can’t always rely on the image to come through perfectly each time you use it. Comparing and buying a backup camera for your RV is the easy part. However, once you have your new gadget, what comes next? We want to give you a more comprehensive understanding of what it takes to make sure that you don’t have buyer’s remorse, so here are a few additional considerations that you should think about before making a final decision. At first, it may seem obvious to put the camera on the back of your RV, but once you consider how you’re going to connect the device to the monitor, then the precise positioning of the unit will matter. In many cases, putting the camera lower to the ground is ideal, since it will give you a better perspective of what’s going to be in your way while reversing. However, in some cases, putting it a bit higher on your rig might make more sense. One way to determine the best spot for your camera is to test it before installing it. Either tape the camera to the back and look at the monitor or have someone hold it in position while you watch the feed. Consider how you will run the wiring through your RV as well. If it makes the most sense to run the cable on top of cabinets and things, then make sure it can work with the placement of the camera itself. For the most part, wired backup cameras are going to be much better in the long run. Although wireless models are much more convenient for installation, the quality can vary wildly depending on environmental factors. In some cases, distortion from your RV can affect the picture, which can render having a backup camera moot. In other instances, the signal may get interrupted, and you won’t be able to see anything at all. That being said, because installing a wireless backup camera is such a breeze compared to a wired version, it may make sense to test it to see if it will work for your rig. Smaller motorhomes are usually better off with this kind of system, but pay attention to how well it works in different conditions before making a final decision. If you’re not familiar with these acronyms, they refer to how well the camera image transfers to the monitor screen. Both sensors are great at what they do, and if you get either option, you shouldn’t experience any significant setbacks. That being said, when comparing them side by side, CCD sensors are always going to be the better choice. They are more expensive, but considering how reliable they are and how sharp the image is, it’s usually worth the higher price. Overall, CCD sensors are built to transfer the image from the camera lens to the monitor much more directly. This means that you have a continuous signal, leading to less distortion or color imbalance. The benefits of CCD doesn’t mean that CMOS is bad per se, but if you want to know which is best, CCD is hands-down the winner. However, if you like the other features of a camera with a CMOS sensor, don’t think that it will cause endless problems for you. If you’re looking for a backup camera that is easy to install, has reliable image quality, and will last for years to come, then look no further than the Rear View Safety Backup Camera. I like this system for its simplicity and effectiveness. Although the menu is not as intuitive as I would like, I appreciate the fact that you can connect up to three cameras to it, as well as the high-definition quality of the screen. No matter what kind of RV you drive, this backup camera is sure to be an excellent buy. Not only will it make reversing easier, but it will keep your rig safer as a result.